Not been out on the bike for about 2 weeks now, had planned to ride to the Ice Cream Farm on Sunday but a spell of snow on Friday put that idea on hold. Things might appear to be fine on the Wirral peninsular but the lanes in Cheshire are not gritted and any snow lingers for days. A few years back 8 cyclists ended up in the Countess of Chester Hospital, all falling on the ice riding to the Christmas Dinners at the Ice Cream Farm. It was still slippy in the car this weekend. A fall is going to put you out of action for months. Monday: Big push to get the kitchen finished , last week was spent bricking up an old fireplace that revealed itself when the plaster was removed. Anyone that tells you old houses were better built is talking out of their backside. The postman delivered a mouse mat from Dennis at CyclingtheAlps.com as he promised to give one of them to Paul at the Berlin Google Devfest they presented at. The app is in the Google Chrome Store and is great, especially in Google Streetview. I’ve also migrated to Google + , it’s everything Facebook isn’t or has become. The cyclist Circle in my stream features good posts, good pictures and no bad language. Will be taking another look at the Garmin Edge pages as they can date really quickly. Tuesday: Another kitchen day, might get to assemble some units later on, looking to get out on the bike later in the week. Wednesday: Drove out to the Eureka for breakfast where Merseyside CTC were the only ones in the Cafe. Dave the 4 square Mayor turned up . Saw some of the site stats last night and some are pretty mind blowing 193,000 since I’ve enabled the counter, god knows what they were before that. Picked up this link from the excellent Cycling the Alps site. Friday: Picked up an infection, mind you there was no way I was going out in that rain. Called in at Vita Cycles and saw the design for the new kit. Looks good especially after all the fun and games on FaceBook in the past few days. The plan for Christmas Eve is for a short ride out to the Eureka Cafe and maybe a bit of last minute shopping. I’d been on Twitter looking to ride out to the Eureka with a few of the Vita guys meeting them on Route 56 at Thornton Hough and had a thirty minute wait as I’d got there early. I’ve got to admit I didn’t expect nearly 30 to turn up. The ride split at Willaston where Ian and Dave opted for the Missing Link, I followed and thought that was it but joining the Chester High road another small group had followed us. Could be the start of something, the group was too big to manage from the front and the elastic band effect was happening at junctions. Those on the back have to chase hard to get back on the group. Should be alright when a couple have some ride discipline knocked into them, like easing up after a junction and singling out on the narrow bits. It looked to be the largest group to turn up at the Cafe, Weaver Valley turned up as we were leaving. This week marks a change of tack on a few fronts, firstly I’ve been off alcohol for 2 weeks now. Can’t say I’ve missed it, it was a routine I’d slipped into and couldn’t seem to break it. I should have known better, it’s the first thing to cut out if you’re trying to lose weight. Secondly I’m aiming to be back on the bike come what may, followed up by hitting the gym and the spinning classes again. Last Sunday went rather well so I’m planning to do the same again. Monday: Up early for a week-long course at Siemens in Manchester. The drive proved to be a bit of a nightmare and not something I want to do week in week out. Course over it was a trip down the M56 arriving home in time to get to the first spinning class of the week at the Oval. Tuesday: More of the same, trip to Manchester this time back for Becky’s spinning class at the Oval. So far so good. Public sector strike tomorrow with the tunnels closed means traffic on the motorway should be heavy. Wednesday: Left early for course with radio reports of the Runcorn Bridge being down to a crawl. Heavy traffic by junction from Warrington but strangely enough the bottleneck where the Wilmslow and Altringham traffic join the M56 was clear with everybody seemingly having the day off. Course going well but no spinning class to go, gives my backside a chance to recover from the Sunday ride and the spinning classes. Thursday: Back to normal, another day in Manchester then a rush down the M56 home. 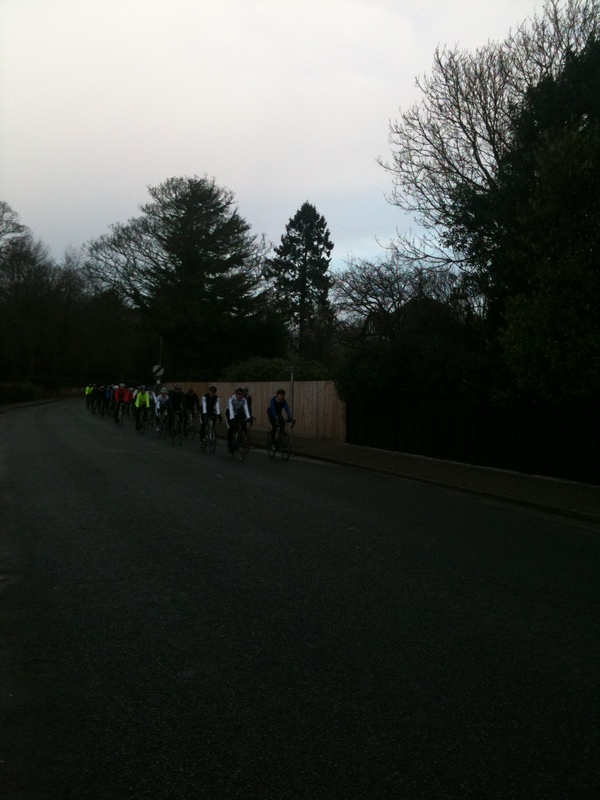 Barbara’s spinning class in West Kirby, only one I could get. By no means full, I put it down to late-night Christmas shopping. Had to put some petrol in the hire car. Hard part was working out how the fuel cap worked. Friday: It’s been an exceptional week at Siemens largely due to the endless anecdotes from the course instructor, if only all courses were like this. Dropped hire car off at work and booked into Becky’s spin class at West Kirby this time. Saturday: More work on the kitchen. I’m now back on the weigh-in routine which has proved a bit of a damp squib as nothing has changed yet. Called in at Vita where I showed Barry the CyclingtheAlps.com site. Stelvio Pass looks unbelievable in Streetview. It deserves a wider audience, which I’m sure it will get. Could be another Vita Challenge in the offing, Stelvio or Zoncolan with the turbo set on max, video courtesy of Google Streetview. The conversation drifted around to Google analytics, site traffic and ad revenue. There is no substitute for content seen a few now that were going to earn a fortune from a blog with adverts only to give up after a month or two when the initial hits dried up because there was no reason to go back to the site. Sunday: Ride day, went out for the paper and it was a mite chilly so I added an extra layer before heading out. First encounter was at the top of the road where an old XJ Jag wanted to squeeze past to save 20 yards to the stop sign. Held my ground and he backed down. Posted a slide show of the ride , it’s the first one I’ve tried so bear with me if it fails. Lots of things happen on a ride that don’t normally make it into the blog. I’d met up with Paul at the ICF and chatted about where things are going with the site. There are going to be a few changes in the next few weeks now I’ve got back into the thick of it again. The Garmin side of things will be brought up to date. Possibly a new theme but one big change will be AdSence when it comes through. Been looking up a couple of the links I follow and like this site all is not a bed of roses. Life has a habit of getting in the way of things. Bumped into the Sunlight at the Eureka after last weeks pictures. JJ’s lad has seen the site but not his dad playing tailgunner for the club ride. The ride home was pretty grim with it raining and the temperature on the Edge showing 1 Deg C. I’d lost my Montane Rain cape from the saddle last week. It was there in the ICF picture last week but not when I was cleaning the bike this morning. It was an £80 jacket. Still, I had the Aldi one to fall back on and it was pretty effective for the price, which was not a lot. Ride update: The retaken pictures of the MagicShine copy lights turned out to be another disaster. Camera shake blurrs the shot on low light levels, a compact camera just isn’t up to the job. Tackling Rest Hill the Magishine picked up signs of hedge cutting that wasn’t there when I set out. Thought I had dodged it but looking at the bike this morning revealed a flat front tyre. More hedge cutting today so avoid Rest Hill for a while.